Just outside Meeptropolis, several meeples on a camping trip are attacked by a swarm of giant radioactive butterflies. 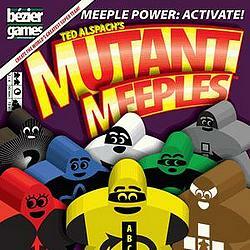 As a result, they all gain super speed and one other unique superpower, turning them into...Mutant Meeples! The city of Meeptropolis has long been in decay, with crimes happening one after the other all over the city. The city council has asked YOU to put together the best possible team of Mutant Meeples to serve as protectors for their fine city. Mutant Meeples is a puzzle game in the vein of Ricochet Robots in which players are looking to find the shortest "path" to get their meeples to the scene of the crime before any of the other players, using a clever combination of Mutant Meeples and their unique superpowers and super speed. If you're the fastest to the scene of the crime, you add a meeple to your super team; the first player to fill his super team with Mutant Meeples wins! But there's a catch – once one of your meeples has reached the scene of the crime, he no longer participates. (After all, he’s already "made the team".) This gives players who have fewer meeples on their super teams more options, and provides an additional challenge to players whose super team is almost full. Mutant Meeples contains a huge 22" double-sided board, eight custom super-powered Mutant Meeples, and much much more.